Yesterday I exchanged emails with a very nice young man who is an IT manager in an international school in the Middle East. He enquired about our advanced classroom technology and our curriculum-centric interactive software and had lots of questions. The problem came when I quoted the price. He replied that his superiors know nothing about quality and are only focused on price. What they know, he told me, is that they can buy “similar” technology at a cheaper price. I explained that if it was in any way comparable to our highly engineered tech, we would be out of business but he tells me that all they care about is price. I replied that school after school after school come to us after having their fingers burnt elsewhere. Over promising and under delivering being the modus operandi of the junk technology suppliers. 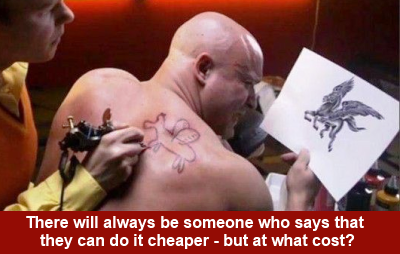 Like the great man said, in life you get only what you pay for. So how do I put my case to his managers that knowing the price of everything and the value of nothing will only lead to far greater expense as costly after-purchase hardware repairs and replacements inevitably become necessary? And software that’s taken us over seven years to perfect cannot be replicated in a few weeks? All contributions/ideas/suggestions sent to me at cot@marsdengrant.com will be gratefully received!